Remember that children, marriages and flower gardens reflect the kind of care they get. ~H. Jackson Brown, Jr. I love the sight of a pristine lawn. It crazily reminds me of a school. The students would be the blades of grass — all about the same but all so different. Those of us who love the look of well-manicured lawns learn that lawn CARE is something required. There are no short cuts, and there are some very specific needs that must happen in order to keep the lawn healthy and ready for action. I know in our CARE for students, we have the similar parallels when it comes to behaviors that show us how to CARE for the lawn. Todd Whitaker, author of several very insightful books shares two tips I want to share. Please take some time to watch and reflect on this powerful information. There are two very short clips. It will make taking CARE of your lawn much easier and more enjoyable. This week in our administrative walkthroughs, we will look for and provide feedback on safety preparations. Do you have your safety chart posted by your door? Are you class rosters there? Do you have your evacuation poster hanging near your classroom exit? 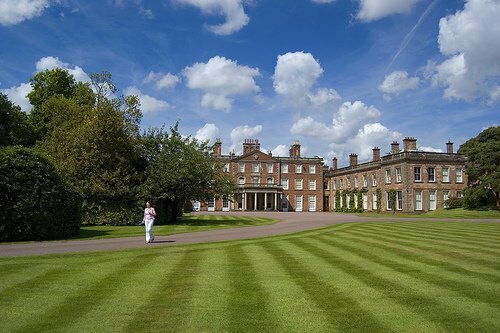 Images are found in CC on Flickr: “Weston Park” by hartlandmartin. This reminded me of a quote I came up with the other day – “The grass can be greener on your side, you just have to water it.” The deeper meaning is the same as Lawn CARE basically. As long as you put effort and care into something, or put your mind to it, you can get it accomplished.